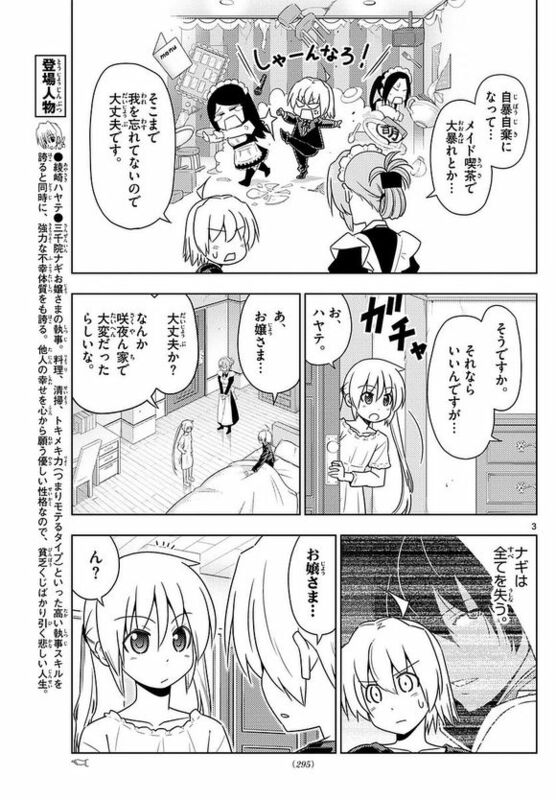 Hayate wakes up from chapter 549. Yes, it was HIS dream. No two ways about it. Anywayz, Maria is there to greet him and he's back in Nagi's mansion. Maria: Last night, you were at Sakuya's place. Wazzup? Maria: Could it be my fault? Maria: Coz I talked about quitting being a maid. Maria: OUt of desperation, you went on a rampage in a maid cafe. Hayate: I won't go to that extent. Forget about it. Maria: Is that so? 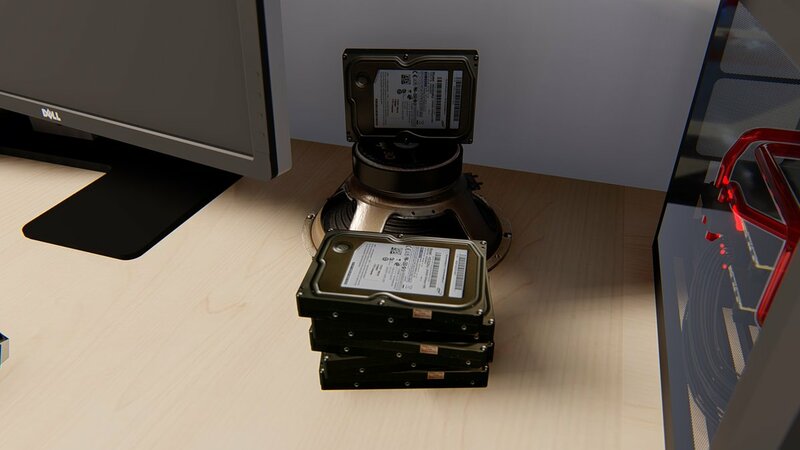 Well then, that's fine. Nagi: Are you okay? It seems that you had a rough time at Sakuya's house. 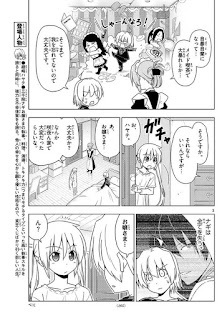 Hayate has a flashback of what Himegami said that Nagi would lose everything. 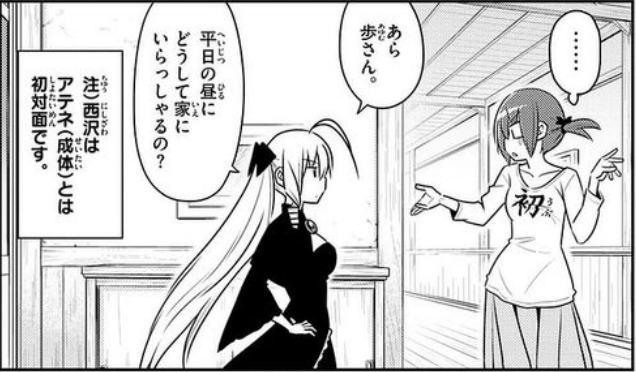 Hayate: You won't lose everything. Nagi has a flashback about Chiharu talking about her marriage with Hayate. Nagi: I see... you're thinking about such things for me. Hayate: Of course! Whether it's the past or future, I will protect ojou-sama! Hayate: Anywayz, I'mma goin out for a while. 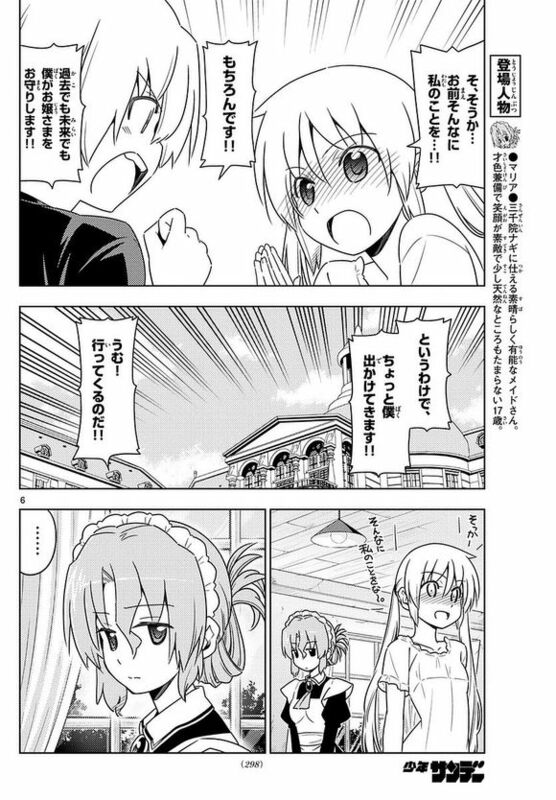 Nagi gushes a bit about what Hayate said. Sakuya: Whatever the case may be, healing the body is good. A-tan: Yes, whatever may happen. It's good to take care of yourself. back. So it's fine, right? A-tan: However, the fact is that two stones were lost. A-tan: Now the enemy can enter the Royal Garden. A-tan: Please stop it with that vulgar talk! A-tan: Anywayz, I'mma goin to teh apartment. Sakuya: Ok, then I'll drop you off in the car. Hayate: I'm glad. Nothing happend to you. A-tan: She's doing better than us. Dun worry. Hayate: However, Himegami and Hisui have joined forces huh? 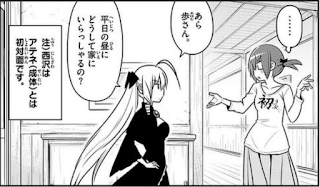 Hayate: Any idea where those two are? A-tan: Isumi's on it, niggah! A-tan: Anywayz, the stones were taken, but it's not over yet. A-tan: Anywayz, we can't afford to make hasty assumptions in this situation. That is why everything will be settled at Hakuo Academy! Hamster: Welcome back, Hayate ku... te...eeeeeeh? A-tan: Oh, Ayumu. Why are you here on a weekday? Aren't you going home? 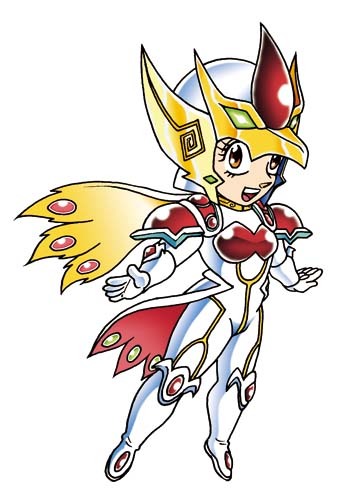 Note: This is her first time meeting adult Athena. (Unaware) A-tan: Ah, so you're doing some late night studying huh? (Still unaware) A-tan: Do your best and you'll get good results! Chiharu: Oh, Ayasaki, you're here. A-tan: Ah, Chiharu. You're here as well, eh? Note: This is also Chiharu's first meeting with big A-tan. Chiharu: Eh? But wait... Why? A-tan: Ah, is it about the morning trip? If that's so. Dun worry about it. A-tan: I was just together with Hayate last night. A-tan: Well, it was a rather violent night. Kayura: So, the second question is. about, will you indulge me? Hayate: The bath is ready. A-tan: The stones were taken. Now it will be easy for Hisui to open the path. A-tan: However, it's not yet time... eh? A-tan: Why is the faucet lower? Ayumu:HAYATE! WHO WAS DAT JUST NOW? Hina: Why is Tennousu san here? Ayumu: And what was up with that "violent night?" A-tan: Oh right... I have my original body back now.